Subscribe to the newsletter at the bottom of the page to get 5% discount on a custom pet portrait and receive updates on new products and promotions. Read about the extraordinary beginnings of the Groenendael, Malinois, Tervueren and Laekenois. Illustrated Belgian Shepherd breed history straight from their country of origin. 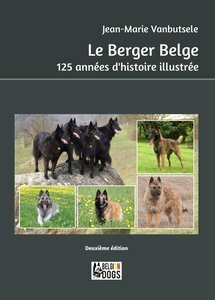 This book, dedicated to the history of the Belgian Shepherd Dog is the result of extensive literature research. It also highlights and honours individuals who have contributed to the birth and growth of the different varieties of the breed. It is richly illustrated, increasing its appeal. Several colour paintings and drawings of animal artists were unearthed and rescued from oblivion. You can select your language in the top right corner of the page where it says EN∨. Le site est disponible en Français. Vous pouvez sélectionner votre langue en haut à droite. Appuyez sur EN∨. De site is beschikbaar in het Nederlands. Je kan je taal kiezen in de rechter bovenhoek. Klik op EN∨.